for drivers on Loop 360 in Austin. In Austin, we relish our quirky status and splash the motto “Keep Austin Weird” across t-shirts, coffee mugs, and bumper stickers. While that’s a year-round attitude, there’s probably no better example of this outlook than the annual holiday decoration of roadside trees. What started as a clandestine nighttime activity many years ago has now morphed into a bona fide tradition practiced in broad daylight. If you’ve driven along Loop 360 between RM 2222 and U.S. Hwy. 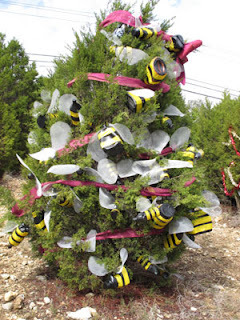 183 in recent weeks, you’ve see the trees covered in tinsel and a variety of unusual, sometimes recycled, ornaments. Trees that normally dot the roadside in all their naked, natural glory are covered with items such as paper candy canes, plastic bottles painted like bees, Christmas stockings, empty Coke cans, red paper plates, and American flags. One year a tree sported Victoria’s Secret bags with boxes from the lingerie store placed underneath—wishful thinking or leftovers from a shopping binge? Long lines of trees decorate the roadside in Austin. Although we’ve seen the display in previous years, a quick drive-by before Christmas left us curious, so we went back to check out some of the more interesting trees. While some look to be simply the result of a happy-go-lucky decorating streak, others have been thoughtfully adorned to commemorate an event or a loved one. 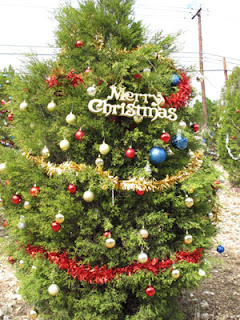 Either way, each tree adds an element of joy and surprise to an otherwise uneventful drive on these busy highways. You can’t help but smile when the line of glimmering trees catches your eye, especially those that are lit at night. 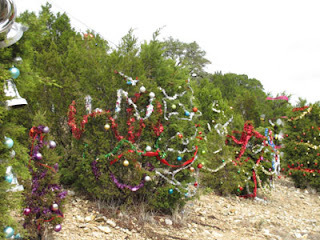 The first couple of years, secret decorators were lax in coming back after the holidays to remove the decorations, so the city of Austin had to send workers out for clean-up. Now, it’s not uncommon for people to take some of the most clever ornaments and save them for the next year or to recycle materials in creative new ways. For some families this has become a caring project that children and parents can be involved in together. Now trees along additional roads including RM 620 S sprout holiday finery, so the ritual must be spreading. 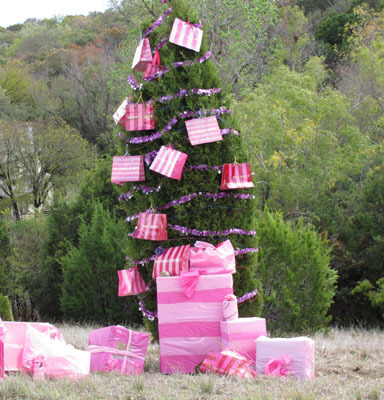 Whether whimsical or inspirational, the trees send a cheerful message about the holiday spirit in Austin. Sure, it’s a bit eccentric, but it’s a great way for Austin to spread joy—one that visitors to the area are sure to remember with a smile. wonderful Post. I Like your blog. Christmas Photo's are amazing.